On or about 1974 the Trek conventions started to become a pretty big event which drew many thousands. Standing behind one table somewhere in the middle of the dealer's hall sandwiched between dealers selling T-shirts, gum cards, Mego toys, & IDIC symbols stood a studious looking young man who sometimes wore a classic Star Trek uniform. His table was basically nothing more than an order form with which you put your name & address once you ordered his product. Most people as they passed by his table would hear the ever popular "oohs"&"aahs" and had to stop, curious to see what the fuss was about. They quickly found out. This studious looking young gentleman was brandishing a new groundbreaking item. To most people at that time, it looked like he just walked off the Paramount lot with an original Star Trek Phaser II. And again to most, it looked absolutely gorgeous, this pioneer copycat was Mr. Brad Nelson. He took the time and certainly the expertise to craft his art to almost the pinnacle of perfection for that period. "Can I see it ?" said someone. "Wait" said Brad "Let me turn it on so you can see what it does." Turn it on??? Now that was a shock. A replica that actually looks like an original phaser, and had machined aluminum parts with all the correct trimmings to boot was impressive enough for 1974. You mean it actually does something?? We thought it might have had some sort of lightbulb in it, some quick light up gimmick that he might have pulled from some kid's toy......not so!! Brad held the phaser so the top faced him, and turned on the thumb wheel, and a light & meter were activated. It fired beautifully with sound, was fantastically bright, and was nothing like a lightbulb. It had 3 settings, the third being the ever popular "overload". 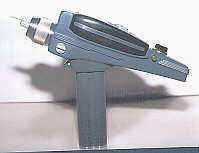 All the controls on this replica worked except the lock release due to the fact that the phaser 1 was not removable because of the electronics arrangement. "How did you manage to make this???" someone asked. Brad explained. As I explained in my previous installment, like most potential copycats, Brad noticed the poor quality replicas whenever he saw them at shows, and knew that he could do better. He hand carved his prototype body from wood, and made a rubber mold and cast his phasers out of marine fiberglass. He had all the metal parts professionally made, and then came up with an interesting idea: he put an actual camera strobe light in it and used a working meter which came from the audiocassette machines of the day, which was pretty close to the size and look of the phaser meter on the original phaser. For the light between the meter and thumb wheel, a grain of wheat light was perfect. It had the feel and the heft of an actual weapon.